The Alberta government has approved an ambitious plan with a $3.3-billion price tag to eradicate homelessness by 2019. The plan announced Monday focuses on moving homeless people into permanent housing and giving them support programs to help keep that accommodation, rather than creating more temporary spaces in shelters. "I can tell you that emergency shelters will no longer be a housing option where people go into an emergency shelter and stay for a long period of time," Housing and Urban Affairs Minister Yvonne Fritz said in Calgary. "This plan to end homelessness is about changing homelessness ... and it's where people may stay in a shelter for 7 to 21 days, you know on a short-term emergency basis as they're rapidly rehoused and that is a significant difference." A key part of solving homelessness is to co-ordinate programs such as income support, employment help, and addiction and mental-health treatment. "The underlying factors that originally contributed to their homelessness must also be addressed" said the report by the Alberta Secretariat for Action on Homelessness. "Too often, an Albertan who is in need of assistance faces a maze of qualifying thresholds and requirements which can be incompatible, result in claw-backs, or create gaps into which the person falls." In addition to aligned programs, four other priorities were highlighted in the action plan, titled "A Plan for Alberta." The approach is based on plans adopted by a number of American cities to eliminate homelessness, said Steve Snyder, chairman of the secretariat. "What we do see — and whether it's in Portland or New York or Denver — other cities where they have developed longer term plans … are getting great success and they are tracking towards actually ending it," he said Monday. "That gives us confidence, if we can head in that direction, we should get the same results and hopefully, we will get there first." 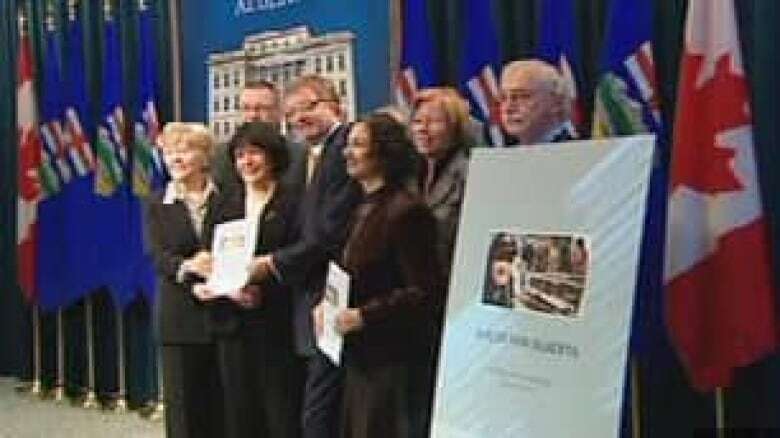 The provincial plan is in line with 10-year plans created in Edmonton, Calgary and Red Deer in the last year. Moving 11,000 individuals and families out of homelessness will require an investment of $3.3 billion; however, the cost of simply managing them would cost $6.65 billion over 10 years, the provincial report pointed out. The report estimated that it currently costs $114,850 a year to manage help for a chronic homeless person in Alberta, but that the plan, if implemented, would cut that to $34,000 per year to provide housing and services. Building the necessary 8,000 new housing units will cost $1.25 billion, while operating costs for support programs will run about $2.1 billion estimated the action plan. The plan's authors acknowledge if changes are not made, the province will be handling more than 21,000 homeless Albertans by 2019 at a cost of $13.6 billion over 10 years. The province has not committed funding to the plan yet; more information is expected in the upcoming Alberta budget.